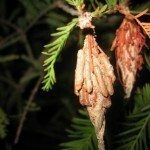 Have bagworms on my Leyland cypress to the point that trees are turning brown and losing needles. Am trying to prevent remaining trees from becoming infested and hope to save the ones that are. They are presently in the cocoon state, so I have been ABLE TO REMOVE SEVERAL BY PULLING THEM OFF. Cannot reach the rest. Please help. Temperature here right now is near 90 degrees. Is it too late?